We are all guilty of holding onto our stress, which leads to bad lifestyle habits and patterns that often find their way into our relationships. So how can yoga help you build a stronger, happy, and loving relationship? Below are just some of the numerous yoga poses and practices that can directly and positively affect your relationship with yourself, others, and your loved one. Check them out and give ‘em a shot! By tradition, we end each yoga class by gathering together in a comfortable seated position, bringing our hands to our hearts, and saying “Namaste.” This beautiful gesture encourages us to show respect to one another, offering a chance to connect with the purest version of yourself. What this can teach you about your relationship: Often, as we become more familiar with those people closest to us, we start to (consciously or not) take them for granted and start to focus more on the negative things around us. Imagine how our outlook could change if we took the time each day to acknowledge and appreciate our partner’s best qualities. A mental “Namaste” in the morning and evening could just be that magic sparkle you need to help you hold onto the love and respect that you have for your partner. 1. Warrior II: Stand strong and warrior away those voices of self-doubt. Warrior II celebrates our unique strengths and qualities, connecting us to the absolute power residing within our bodies—starting with our legs then reaching every single muscle and joint to keep us strong like a warrior. This is an excellent pose to restore a feeling of power. Dig deep into your heart and hips and sink down low to the ground. Keep a focused and clear mind, knowing you can achieve absolutely anything you put your mind to. As you do the pose, say a silent “I can and I will” to any problems or voices of self-doubt! What it can teach you about your relationship: As in life, without a steady foundation in these poses, you’ll never be able to reach your maximum. Standing poses teach you firm grounding so you can grow, show your true colors and inner strength, and reach your full potential! 2. Dancer Pose: Perfect your mental focus and sense of clarity. Balance poses highlight our state of mind; it’s hard to stay steady in a pose when your mind is racing. Standing balances like Dancer lets you develop a sense of poise and steadiness, clarity, and focus when you’re anxious or mentally stressed about what comes next in life, love, friendship, or a new romance. What it can teach you about your relationship: Sometimes our relationships can feel a lot like balancing on one foot. There are times when we’re wobbly and worry about completely falling over. When this happens, the negative voices creep into our minds, causing anguish and suffering. Yoga teaches us to live life in a centered way, rooted in our inner reality: not being too dependent on others, but also not too distant. We learn to take responsibility for our own happiness and do not expect others to make us happy and fulfilled. 3. Wheel Pose: Keep your heart open, be fearless. This tremendous backbend engages every single muscle in the body. Extending backwards into the unknown helps you confront your fears when life throws you a curveball. In this pose, let your body and mind feel invigorated, increasing your trust in yourself, your journey, and your decisions. Backbends are uplifting because they open the chest, promoting better breathing, and the heart center expands to bring joyful vitality into your life. What it can teach you about your relationship: We're often guilty of not putting enough heart into our relationships. This is why including a heart opening pose in your daily practice will help you create an open and honest environment in which your relationship can flourish. 4. Headstand: Turn your world upside down; see life from a different perspective. When you turn your body upside down, you increase circulation back to your heart, which in turn calms the nervous system, nourishes the brain cells, balances the hormone system, and strengthens the spirit. Anything that strengthens our spirit is a MUST to practice! What it can teach you about your relationship: It’s easy to get stuck in a rut if you’re both doing the same things day after day with little room for spontaneity. Things can get stale, and they can lose their edge. Bedroom life can lose its VAVAvoom, dinner conversations can get dull. Turning things upside down can refresh your relationship, transforming things incredibly! Inversions have us holding a position with a different relationship to gravity, which demands steadiness of body and mind, and as such, they are calming poses that bring clarity and new perspectives. 5. 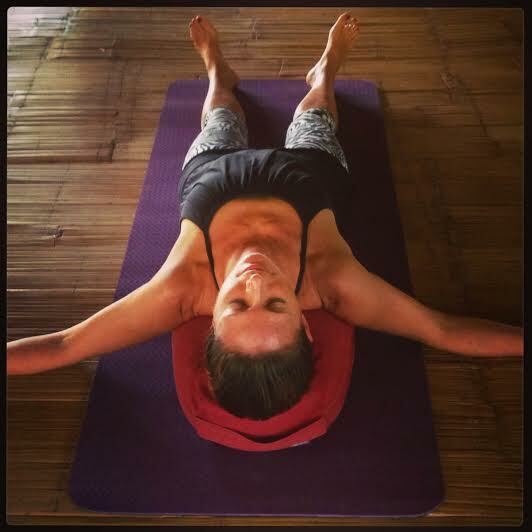 Savasana: Find a deeper inner peace and learn to accept support. Savasana is time for your body to integrate the effects of your practice. It’s one of the hardest yoga poses because it requires complete surrender: a stillness of mind and body. During this time, the breath can be used for healing and energizing the system. What it can teach you about your relationship: Relationships require us to surrender, be vulnerable, and let our partners hold us—at times, even carry us. Savasana opens us up to a level of vulnerability and leaves us completely refreshed. The more we do it, the better we’re able to let go. While you progressively let go of tension in the body, mind, and heart, two things happen: you access a deeper inner peace, and you let go of the need to micromanage everything, instead embracing each thing and moment as it comes. It also lets you tune into your inner voices, and in turn, learn to share the true version of yourself with your partner. Learn to live your life to inspire yourself, your loved ones, and others you might encounter on your path. Like happiness, inspiration is contagious, so smile at the world each day, make an intention each morning as you wake up, put it out to the universe, and watch your relationships blossom!